Make Friends. Have Fun. Help Others. 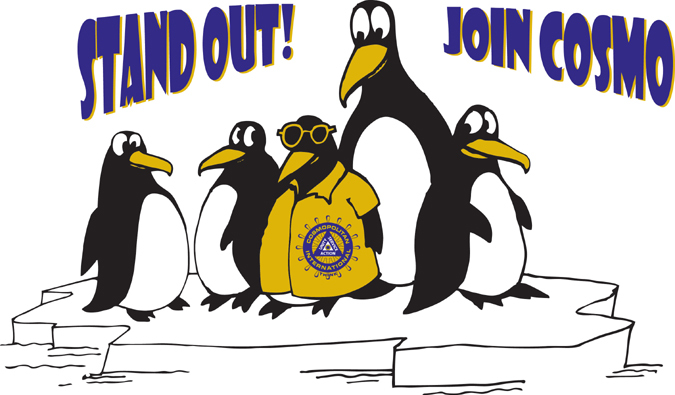 Millions of people go through life without ever being asked to join a dynamic service club in which they make quality new friends, serve their communities, all while having FUN! We don’t want that to happen to you. We invite you to share in service and fellowship and join us in enriching the lives of others through UNITY, SERVICE, and ACTION. You’ll enjoy developing new and lasting friendships and business contacts while you work in UNITY for the benefit of your community. Members of Cosmopolitan International contribute to their local communities and their International organization. Known as The Club that Fights Diabetes, Cosmopolitan SERVICE focuses on preventing and curing diabetes touching the lives of thousands of people—maybe even someone you know. A cross-section of members from business and community life enables the Clubs to take ACTION, participating in a broad range of other community service projects, as well. You will value and utilize the personal leadership skills you will develop as a member of Cosmopolitan. Cosmopolitan International service projects – however large or small—aim to serve both individuals and communities. Our Clubs across the US and Canada raise funds to assist in diabetes research as well as help their local communities by sponsoring projects that are used by many people through their community. We can boast that we raise the most money per capita than any other service organization. Our Clubs raise and then donate over $950,000 annually to diabetic and community related causes. Anyone is welcome to attend a Club meeting, and why not bring a friend with you to the meeting! For a listing of our Clubs, visit go to Federations & Clubs under the About Us section on our website. If you don’t have a Club in your area, consider starting one with a group of friends or colleagues. All you need is 20 people to charter a Club. We also have an At-Large membership available for those people who do not have a Club in their area and aren’t able to start one at the present time. If you are interested in joining, then please do not hesitate to send an email to headquarters@cosmopolitan.org or call 1-800-648-4331.